Away from Rome things were going badly. In Gaul and Spain troops deserted and set up in bands to make a living by raiding the cities. When a belated crack down came Maturnus, the leader of the bandits ordered his followers to split into small groups, and make their way to Rome. They would regroup at the feast of Cybele in March. Then they would overthrow the emperor and place Maturnus on the throne. The plot was betrayed at the last moment, but even the attempt was a sign that something was wrong. Probably it was as simple as funding. The lavish lifestyle of the Emperor had to be paid for from taxes. Money spent on circuses could not be spent on the army. If you don’t pay the troops properly you will have problems. Commodus is the emperor who features in the Russell Crowe film Gladiator. It’s a great film. Nobody expects Hollywood to let the historical facts get in the way of a good story, and the history in the film bears only a passing resemblance to what actually happened. The interesting thing is that, if anything, the historical Commodus was worse than the one we see in the film. And, the real events were in the ‘you couldn’t make them up’ category. A plot to join up in Rome under cover of a religious festival and overthrow the emperor sounds more like a movie script than an actual piece of history. It’s a shame the plot was foiled before it got to the fight scene. Machiavelli asserted that it was better to be feared than loved. Well, up to a point. Commodus went beyond that point. He showed no loyalty to those close to him. It must have been obvious to his favourites that as long as Commodus lived their days were numbered. They made the calculation that the only course of action open to them was to get him first. The plotters were Marcia, his favorite concubine who had saved the day when Cleander fell, Eclectus, his chamberlain, and Laetus, his Praetorian prefect. Marcia drugged his wine after he got back tired from a hunting trip. As he slept a wrestler was sent in to strangle him. Now the drama began. They had settled on a respected senator called Pertinax as the replacement for Commodus, but he knew nothing about it yet. Senators were living under a reign of terror. 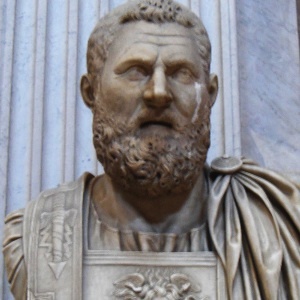 Pertinax must have mentally prepared himself for the knock on the door in the middle of the night. When it came, there was some difficulty in getting over the idea that they had arrived not to kill him but to offer him the Empire. When he finally understood what was happening he managed to assume power with great speed. He was able to win around the Senate and took control of the government quickly and effectively. By the next day Rome had a new emperor. There were a host of pressing problems. Finance was the main one– Commodus had emptied the coffers. Discipline needed to be re-established in the army. Financing the army was another issue. The tax burden had become unsupportable thanks to the huge cost of the court. He seems to have set out to tackle things with skill and energy. Frivolous spending was cut and taxes were reduced. Unfortunately his reign was to last only 68 days. The Praetorian Guard had had no hand in either the removal of Commodus or the elevation of Pertinax. This was not at all to their taste, and they murdered him. Pertinax faced his attackers and tried to overawe them with the power of his personality and the office he held. He was a brave man and met his end with courage. He could have been another great emperor but became instead a footnote to the reign of one of the worst. Gibbon chose well in selecting this point as the start of the decline and fall of the Roman Empire. The flaws in the character of a spoiled young man handed absolute power had disastrous consequences. The decline of discipline in the army was lamentable. But the growing prominence of the Praetorian guard was even worse. More subtle was the erosion of the rule of law. In an ordered society your rights to your property are respected. This is something that we appreciate in its own right, but also gives people the incentive to improve things for themselves which works to make society stronger and more productive. When all that you have worked for can be lost at the whim of an arbitrary autocrat this is not the case. The career of Pertinax himself is a good illustration. He was a self made man who under Marcus had raised himself into the top rank of the citizens by hard work and merit. He came from the same mould as a Vespasian or a Trajan. It was men like this that really built the empire. We will be hearing less about this kind of person our story unfolds. A tyrannical government leads, sooner or later, to a weak state. As we finish Chapter Four, Rome was still so strong, and its enemies relatively so weak, that it was not yet inevitable that the empire was doomed to decay still further. The resources at the disposal of Rome were still enormous. Bad as the reign of Commodus had been, decline was not yet embedded. Another run of good emperors could still restore its fortunes. It is early in 193AD. We leave the choice of the next emperor in the hands of the Praetorian guard, hoping that they will come up with some dignified way of choosing a worthy successor of Augustus, Trajan and Marcus.